To me, asparagus means spring has arrived. Local asparagus where I live doesn’t arrive until late spring, early June, usually, but with Easter this weekend, asparagus is abundant at the store this week, and on sale. The recipe for French Fridays with Dorie this week is Asparagus with Bits of Bacon. This was a relatively simple side dish. 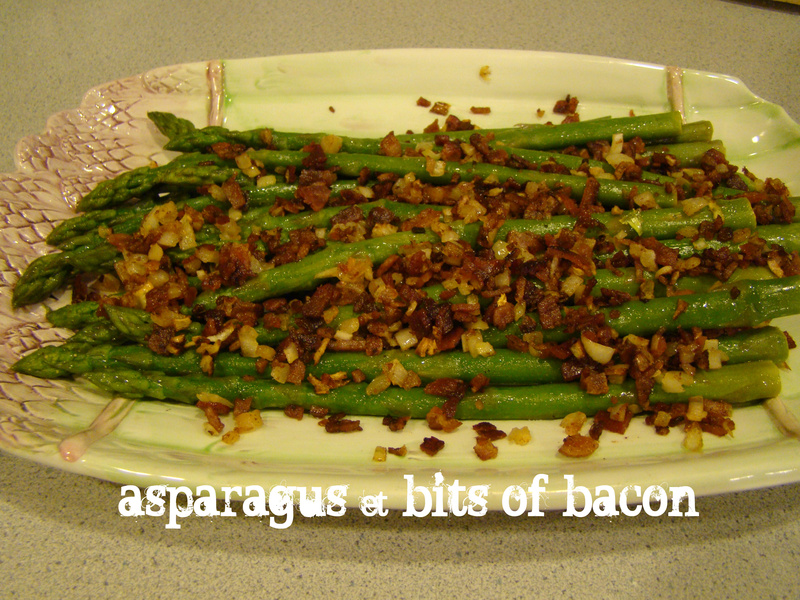 Boiled asparagus tossed in a light citrusy dressing and topped with bacon and onion. Whoa! When I cook asparagus, it’s usually steamed in the microwave and served plain, so this was much fancier. This recipe said to boil the asparagus in salted water, so I followed suit. I have to admit that the asparagus spears stayed a nice bright green and looked prettier than when they’re microwaved, so I’ll have to remember that. The bacon is fried until crisp, and then chopped into bits. Then, you warm chopped onion and the bacon bits in some of the bacon fat. You aren’t supposed to cook the onion, but I really didn’t like the flavor of raw onion, so I just let the onion bits soften completely. The only bacon I could find was maple-flavored. I was nervous the final dish would have an off flavor, but it wasn’t noticeable. Of course, the dilemma for me is always was to serve with the side, especially on with so much personality. The asparagus, with all the bacon, could almost have been the main course, I wasn’t sure how to round out the plate. I ended up going with something more traditional, leaving the bacony veggie as a side. Nigella Lawson helped me out. I had a porky meal with her Mustardy Pork Chops as the entrée, and her Rapid Roastini (sautéed gnocchi) for the starch. I liked the asparagus, but if I made it again, I’d use less bacon to lighten it up. Otherwise, it was a nice change from plain veg. 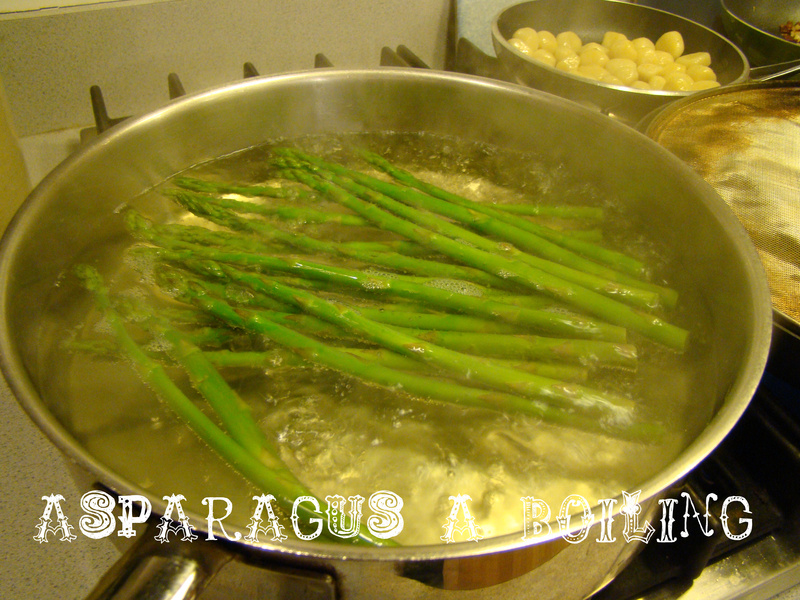 Check out the other Dorista’s asparagus experiences here. We don’t post the recipes, but you can find it in Dorie Greenspan’s book Around My French Table. It’s definitely worth adding to your library. Next week’s French Friday recipe is a little controversial, Sardine Rillettes. I’ll admit up front that I’m looking forward to it, but tune in next week to see if it lives up to my anticipation. 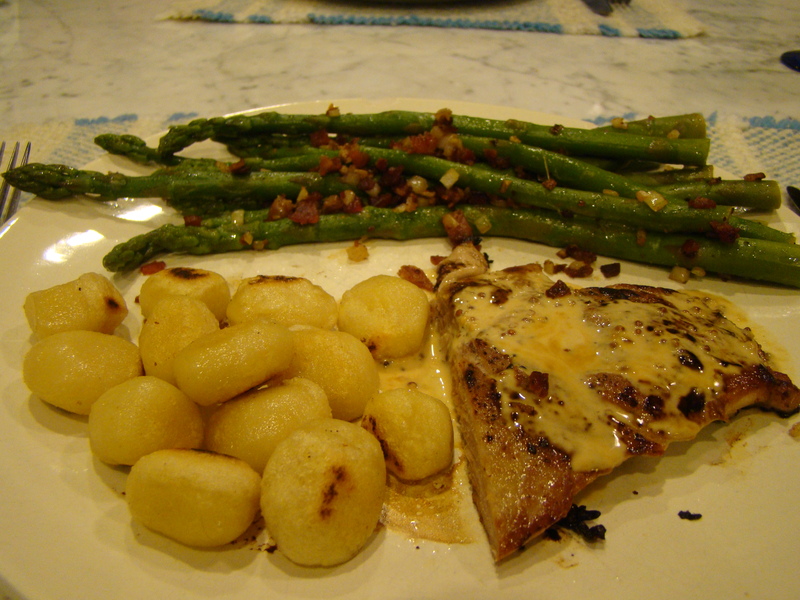 Posted on 6 April 2012, in French Fridays with Dorie, Spring and tagged asparagus, bacon, French Fridays with Dorie. Bookmark the permalink. 24 Comments. I love your pork meal – it looks terrific. Your plate looks delicious, looks like Dorie & Nigella came through for you. I loved this dish but I agree that it was a little too heavy with all that bacon for a regular side. What a great asparagus plate! Your whole dinner looks excellent, glad you enjoyed this one. I like your process photos. They look delicious. Your meal looks amazing- yum. And you had me at the “asparagus plate” in the first shot :) Yours is truly stunning and I like it even better than my own. Still fun to be able to take them out again and welcome spring again. Have a wonderful weekend ! I am already scared for next week’s sardines…..
Looks like you prepared a delicious meal! And as mentioned in previous comments, the asparagus serving dish is very pretty. Many Happy Easter wishes! Can’t wait to see next weeks’ posts! Your asparagus looks delicious, Betsy. I wish I was anticipating the sardine rillettes as much as you. It will be very interesting how this recipe goes over at my house. Have a wonderful weekend! I love that asparagus signals spring for so many of you guys! We are heading into autumn and for me it means roasting chestnuts! Your asparagus looks great with pork chops! From the other end of the spectrum, I didn’t even know I can cook asparagus in microwave! I was brought up on stirfry or blanched asparagus and they are always bright green. :) Glad you enjoyed the dish. Don’t be nervous about the sardine rillettes. I promise it’s a good one. Beautiful Spring meal…your asparagus side looks perfect. When I cook my crispy bacon in the microwave in paper towels, there is always bacon fat at the bottom of my dish when I lift out the towels. I had 2-3 tablespoons of fat to use for the onions and bacon…it is a melted, clear fat without bacon pieces, not that bacon pieces would matter, but nothing is fried to a pan and is never hard to clean up. I love your special asparagus plate! I think “Sardine Rillettes” sounds like a disease – so, I’ll be bowing out. I totally ate this for lunch (with some Easter candy)! Your meal looks delicious! Oh, this is a great dinner – especially when paired with mustardy pork chops! I love asparagus season! It’s one of those things I only eat in spring. I paired mine with simple roast chicken, but your pork chops look like a nice choice too. Your asparagus platter is beautiful and your meal sounds delicious. I have to admit that we ate this dish as a meal in itself and were well-satisfied. I cooked my onion until soft, too. It became sweet and was perfect with the other flavours.